The TrackMan Marble from Logitech is a space-saving ambidextrous trackball with a well-established record. Somewhat unique to the TrackMan Marble is the forward placement of the 40 mm trackball which sees the ball positioned almost at the very front of the unit. This puts it directly under the fingertips of the ring, index and middle fingers, freeing users to employ any or all of these in providing cursor control. 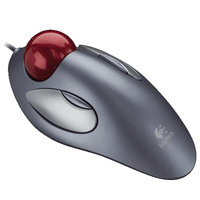 The long Left and Right click buttons are located further back along the sides of the trackball body, providing easy access for the thumb and ring or pinky finger. Small inset secondary buttons offer web browser Backward and Forward commands. Cursor control on the Trackman Marble is very smooth and accurate, with the ball weighing enough that response is easily controlled. The weight of the ball is also great enough to enable users to "spin" it for rapid movement across large areas or multiple screens. The narrow design of the TrackMan Marble is best suited to users with small to average-sized hands as those with larger or wider hands may tend to "pinch" the trackball in order to maintain placement. However, the length of the body and the primary buttons does mean that users with longer hands can accomplish excellent cursor control while still easily performing click actions. Some users may find the absence of a dedicated scroll feature on the TrackMan Marble less than ideal. 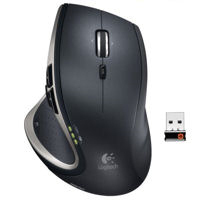 However this concern can to a great extent be addressed by installing and running the customization software available from Logitech which can enable the trackball to be used as a scrollwheel (on PCs) or the Back/Forward buttons as Scroll Up/Down (on MACs). Note:Unlike many trackballs, the ball on the Trackman Marble is easily removed from the housing for cleaning. With Logitech's Performance Mouse MX you can track virtually anywhere - even on a glass desk - with Logitech Darkfield Laser Tracking. Turn the world into your mouse pad. This new mouse also incorporates the Logitech Unifying receiver - the tiny, wireless receiver that stays in your notebook and lets you add devices as you need them. Plug it. Forget it. Add to it. The micro-USB recharging system lets you use the mouse even when it's charging. You'll fly through documents and Web pages with a single spin. Click-to-click scrolling gives you the precision you need when navigating lists, slides, and images. Designed to fit your hand and put it in a comfortable, natural position, the Performance Mouse MX also has customizable thumb buttons to help you do more, faster. Move backward or forward through Web pages, zoom in or out on photos, and jump between open windows. Note: Although this is the recommended replacement for the MX Revolution Mouse, the revised shape makes one's hand more pronated (i.e. flatter) on this version than the old MX Revolution Mouse. 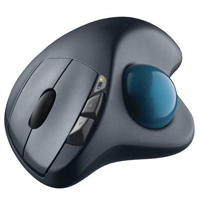 The M570 Wireless Trackball takes most of the repetitive movements and strain which the entire hand usually must perform and allocates all the workload to the thumb of the user. Accurate optical tracking is provided by a 570 DPI laser sensor housed below the ball. With a contoured body that provides a relaxing support for the hand, the M570 is equipped with a scroll wheel and right and left click buttons, all positioned as with a traditional mouse. In addition there are Back and Forward Buttons for convenience when browsing through multiple pages. 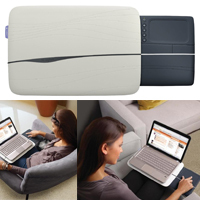 Connection is via a storable USB mini receiver and a single AA battery can provide up to 18 months of service. A battery life indicator will advise when the battery needs replacing. 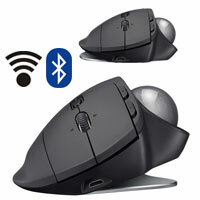 Software available from Logitech enables users to customize their trackball functions and performance. Note: As the M570 places the workload fully upon the thumb, (which on most other trackballs is generally shared amongst several fingers), anyone who has existing thumb issues would be well-advised to consider alternative solutions. The Corded Mouse M500 from Logitech is a comfortable, contoured mouse with hyper-fast scrolling for increased productivity. It features laser precision tracking for smoother tracking on just about any surface (excluding glass and mirrors) and forward/backward buttons for quickly scanning through documents or browsing on your favourite websites. The G500 has a hard to believe 20 programmable buttons, making it arguably the most customizable mouse Logitech has ever offered. 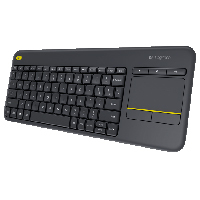 The design was inspired by the needs of MMO (massive multiplayer online) gamers who require quick access to a wide variety of programmable functions, including customizing the color of the side buttons on the thumb keywell. The mouse even features an onboard memory feature which allows the user to switch between three memory profiles on any computer (even without a driver installed). The three large primary buttons are rated at 20 million clicks, well suited for taking the heavy repetitive load that gamers will put on the buttons. A 1 millisecond USB report rate may tax the PCs communication speed but will ensure minimal lag time when performing mouse actions. 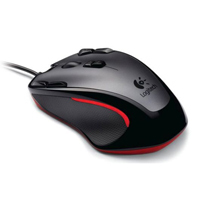 The Gaming Mouse G300 from Logitech is a wired ambidextrous mouse with nine programmable controls and onboard memory for up to three player or game profiles. (These can be transferred from PC to PC). 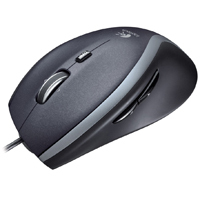 This versatile mouse is configurable with easy-to-use driver software, including automatic game detection functionality. Each profile can also be assigned one of seven colours for easier profile identification. 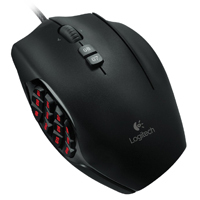 La Gaming Mouse G300 de Logitech est une souris ambidextre avec fil. Elle a neuf controles programmable et un fonction mémoire intégrée pour des joueurs jusqu'a trois personnes (vous pouvez faire le transfere d'un PC à l'autre PC). Cette souris versitale est configurable avec des logicièls facile a utiliser, incluant la fonctionnaliter du détection automatique des jeux. Chaque profil peut aussi ce faire attribué un des sept couleurs pour faciliter l'identification des profils. The Touch Lapdesk N600 from Logitech keeps your lap cool while you are busy typing on your laptop or navigating using the pull-out wireless touchpad featuring three levels of gestures: one finger to move the cursor, two for scrolling, and three for swiping through pages or pictures. The 5-inch touchpad easily stores in the device when not in use. 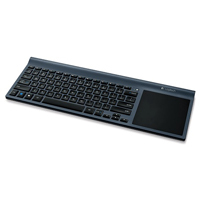 Just plug in the Logitech Unifying receiver into a USB port and you are ready to go.